Ocean Breeze East, the affordable condo directly on the gulf, is perfect for those who enjoy small complexes. The building has 31 units with a Gulf front swimming pool and a large sun deck. Pool is 10 steps to the left of the patio. 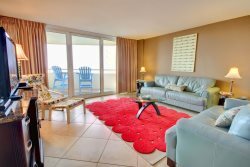 This ground floor condo has 980 SF of living area and Gulf Front balcony access from the Living Room and Master Bedroom. Carpet throughout Living, Dining and Bedrooms with Ceramic Tile in Foyer, Kitchen and Baths. Electronics include 40" TV, DVD in Living Room, 28" TV in Master Bedroom and 28" TV in Guest Bedroom. This is a beautiful and well maintained condo. The furnishings, appliances and decorative items are top notch. The unit is extremely clean and the blue color scheme was lovely! We had everything we needed for a wonderful holiday. Thank you for such a wonderful and relaxing experience. We have been using Perdido Realty for 10 years and have always enjoyed it. Re-booked into a gorgeous condo and the floor plan is awesome and the unit is perfect.